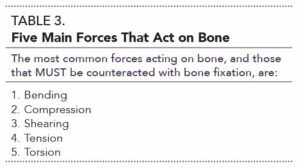 Identification of bone healing and complications (if they occur). In Part 1 of this series, fracture biomechanics, fracture classification and diagnosis, and selection of proper fixation technique were addressed. 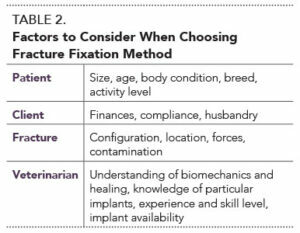 In this article, selection of fixation technique is further discussed, along with the specifics of external coaptation, identification of bone healing, and potential complications. 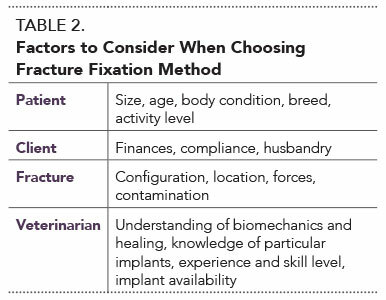 The last article in this series will address several different internal fixation methods. Whether opposing forces (Table 3) can be counteracted with a particular fixation method. 2. More recently, minimal reconstruction to preserve blood flow to the fracture site (“the gardener”). Preserves blood flow to the fracture, and does not disrupt the blood clot at the fracture site during surgery. External coaptation can effectively counteract bending and rotational forces, provided the joints above and below the fracture are immobilized. However, fractures subjected to compression, shearing, and/or tensile forces require internal fixation. Furthermore, comminuted and long oblique fractures are not ideal for external coaptation. When external coaptation is chosen, fracture reduction greatly increases the chances for primary fixation healing. The “50/50 rule” applies, and states that fracture ends should have at least 50% contact to expect fracture healing. Unfortunately, this rule also states that 50% reduction is the absolute minimum for bone healing to be possible, not probable. If the fracture cannot be reduced appropriately, then some type of internal fixation should be pursued instead. External coaptation is defined as the use of bandages, splints, casts, or other materials to aid in stability and support for soft and osseous tissues. Furthermore, external coaptation can help manage wounds and control edema. Temporary fixation for an open fracture and/or until definitive surgical correction can take place. External coaptation should only be used in fractures distal to the elbow and stifle, as correct application requires immobilization of the joints above and below the fracture. Certain splints, such as spica splints, can help immobilize more proximal injuries (humerus and femur); however, given the location of these fractures, external coaptation may create a fulcrum effect with the bandage. Fracture alignment is imperative to limb function. Once the bandage/splint has been applied, assess both reduction and rotational alignment with radiographs. Joint stiffness is common after immobilization; therefore, place and develop the bandage/splint to achieve maintenance of a neutral standing position. There are a number of different types of splints available, ranging from spoon splints to tongue depressors (as used with small puppies and kittens). We prefer to use fiberglass, which allows a custom-made molded splint to be created. These can be placed either palmar or lateral in the forelimbs or lateral in the hindlimbs. Attempt to reduce the fracture prior to applying external coaptation. 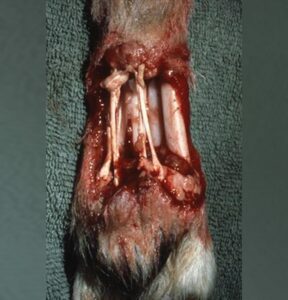 If there is an open fracture, immediately flush the wound and debride dead tissue. After appropriate wound care, cover the exposed bone and/or wound with a sterile dressing. Apply temporary fixation, which may include only a soft padded bandage, such as a Robert Jones bandage, or a splint, such as a fiberglass, spoon, or plastic splint, incorporated into the Robert Jones bandage. After bandage/splint placement, take a radiograph to ensure alignment. With open fractures, change the temporary bandage daily to allow for wound care prior to definitive fixation. Unfortunately, since external coaptation is only recommended for fractures distal to the elbow and stifle, temporary stabilization of humeral and femoral fractures should not be attempted. In these cases, hospitalization with confinement to a crate (along with analgesic relief) may be ideal while awaiting definitive fixation. Cast sores (63% morbidity with external coaptation1) (Figure 1). 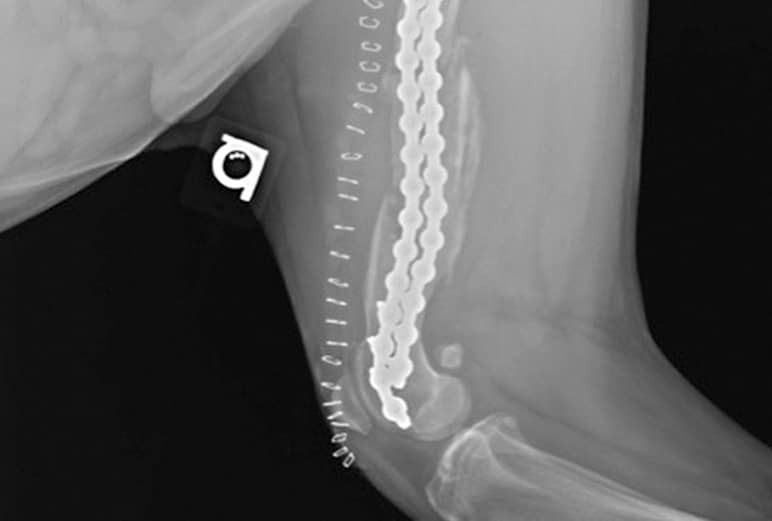 Another risk is eventual need for surgery if healing fails to progress, which is especially of concern in small breed dogs with radius/ulna fractures. 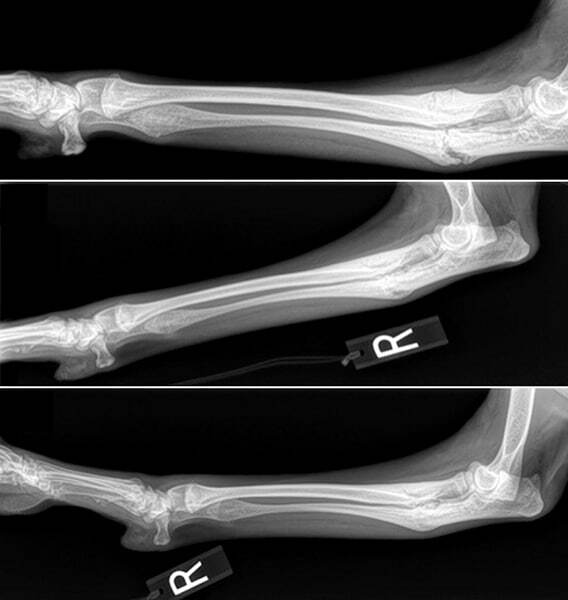 Although these fractures may be minimally displaced and appear to lend themselves to external coaptation, in small breed dogs the blood supply in the distal radius is decreased compared with large breed dogs, putting small breed dogs at a higher risk for healing complications.2 In small and toy breed dogs, 83% of distal radius/ulna fractures addressed with external coaptation alone result in malalignment or nonunion.3,4 Therefore, internal fixation is recommended for these fractures in small and toy breed dogs. FIGURE 1. Although not the case in the image shown, improperly applied and maintained casts can result in similar injuries, and these injuries may necessitate amputation, which was required for the patient in this image. Technique. Ideally, sedate or anesthetize the patient for fracture alignment and splint placement. Then apply a soft padded bandage and fiberglass splint made specifically for the patient. The splint should span the joint above and below the fracture, and be padded enough to prevent pressure sores and prevent movement of the limb within the bandage. Radiographs should be obtained after bandage application to confirm appropriate fracture reduction. Follow-Up. Initially, the bandage may need to be changed every 1 to 3 days, especially if a wound is present that requires ongoing management. Otherwise, change the bandage a minimum of every 10 to 14 days to assess the limb for pressure sores or other bandage complications, such as contracture, rotational malalignment, or dermatitis. Instruct the client to keep the bandage clean, dry, and intact as well as to monitor the patient’s toes for any evidence of swelling or pain. In puppies with greenstick fractures, radiographs can be obtained as soon as 2 to 4 weeks after the injury due to rapid bony healing. A bony callus, spanning a minimum of 3 cortices on orthogonal radiographic views, typically confirms radiographic healing of the fracture. The callus should span the fracture gap on 3 of the possible 4 cortices: medial, lateral, cranial, and caudal. External coaptation can be used as ancillary fixation to provide additional support in patients with radius/ulna fractures that, for example, have already undergone bone plating. As mentioned earlier, distal radius/ulna fractures, especially those in small and toy breed dogs, addressed with external coaptation alone commonly result in malalignment or nonunion. Schroeder-Thomas splints are never recommended for fracture stabilization. Schroeder-Thomas splints are traction devices constructed of wire frame and soft bandage material. Since the splint does not adequately immobilize the shoulder or hip joint, it is considered contraindicated in humeral and femoral fractures. While a complete description of the physiology of bone healing is beyond the scope of this article, in general, bone healing of a stable fracture occurs through direct bone healing as opposed to indirect bone healing, which is seen with unstable fractures or certain fractures addressed with external coaptation as a primary means of fixation. Adapted from Johnson A, Houlton J, Vannini R. AO Principles of Fracture Management. New York: Thieme Medical Publishers, 2005. Inflammation: This phase traditionally lasts 3 to 4 days or longer, and is characterized by a fibrin-rich clot at the fracture site. This clot releases growth factors to simulate bone healing and potentially acts as a scaffold for migration of inflammatory and reparative cells. Repair: During this phase, the clot is slowly replaced by granulation tissue, which adds slight mechanical strength. As collagen fibers become more abundant, granulation tissue is replaced by connective tissue and, after formation of connective tissue at the fracture site, resident mesenchymal cells differentiate into chondrocytes to form cartilage. With the help of growth factors, such as bone morphogenic proteins, the cartilage begins mineralizing to form woven bone. Initial resorption of the fracture ends is noted radiographically by loss of radiopacity and widening of the fracture gap; this process can be noted around 5 to 7 days after the injury. Callus formation is not noted radiographically until it becomes mineralized; however, there is typically some phase of tissue healing present in the fracture site, such as a hematoma, granulation tissue, and connective tissue, which are all components of indirect bone healing. The callus is noted first as a collar around the fracture site (the periosteal component), which may be seen as early as 10 to 12 days after repair (Figure 2). As healing progresses, the callus becomes more identifiable, the fracture ends become more radiopaque, and the fracture line begins to disappear (Figure 3). FIGURE 3. 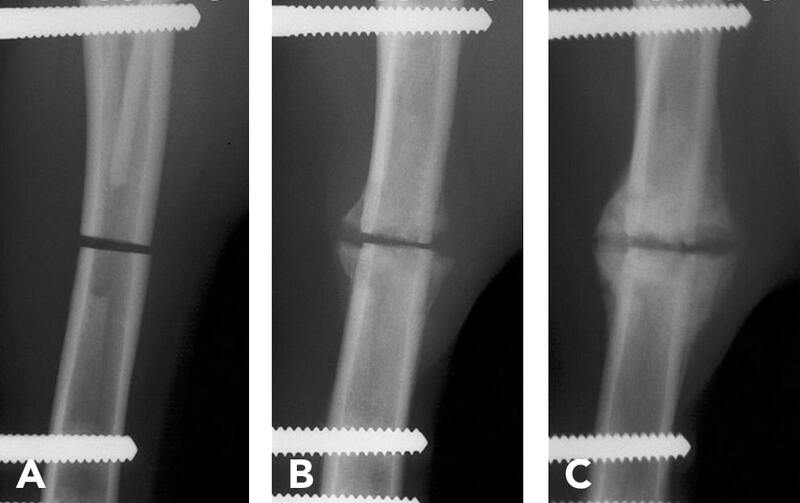 A right radius/ulna fracture in a 10-month-old boxer puppy that was treated by external coaptation (note that primary fixation is indicated in this case), showing secondary bone healing at 4 weeks (A), 8 weeks (B), and 12 weeks (C) after injury. Note that over time the ulnar fracture develops a slight callus formation. 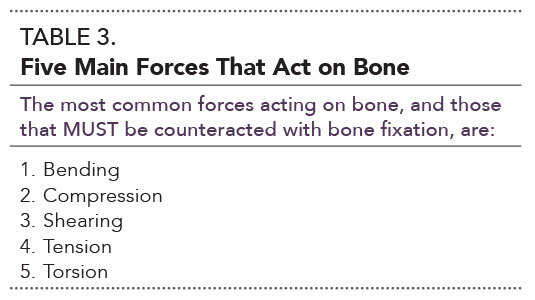 As the tissues in the fracture gap are slowly transitioning into bone, the fracture line begins to slowly disappear. Due to using external coaptation, there is thinning of the cortical diaphysis of the ulna resulting from immobilization. Wolff’s law —a theory developed by German anatomist and surgeon Julius Wolff—states that bone in a healthy person or animal will adapt to the loads under which it is placed or, more simply, bone adapts to pressure, or a lack of it. Numerous complications can occur with bone healing and fracture repair. Implants are under constant load while the bone is healing and are at risk of implant failure when put through cyclic strain due to excessive motion of fracture fragments, overuse of the limb, or poor confinement of the patient. Implant failure can occur in the form of screw back out or breakage, plate bending or breakage, bending of IM pins, breakage of ILN screws or bolts, breakage or migration of cerclage wire, or loosening of external fixator pins. Implants can also fail due to infection of the implants, or poor healing qualities of the bone (Figure 4). FIGURE 4. 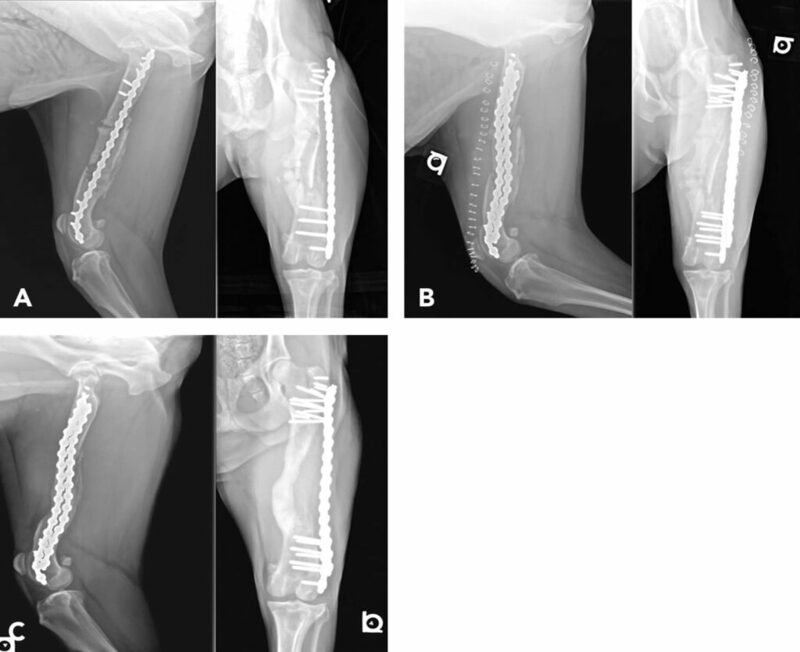 Lateral and craniocaudal radiographs after patient presented for sudden onset of right hindlimb lameness approximately 4 weeks after fracture repair (A). Note the IM pin was removed approximately 1 week prior to the sudden onset of right hindlimb lameness because it was migrating and causing irritation; on the craniocaudal view, note that all of the proximal screws have broken, leaving the fracture unstable. Immediate postoperative lateral and craniocaudal radiographs (B) of a revision that replaced screws in the proximal segment and augmented the fixation with a second plate for additional stability. 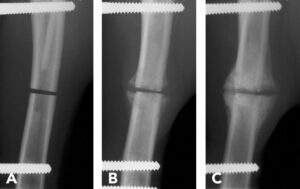 Four-month postoperative lateral and craniocaudal radiographs (C) revealing fracture healing; note that the bone altered its shape during healing; however, due to maintenance of axial alignment, the alteration did not create a clinically significant problem. Oligotrophic: No radiographic evidence of bone healing; hard to distinguish from a nonviable nonunion. Atrophic: Nonviable nonunions in which dead bone is removed by the host without a healing response. Malunions result when fractures heal with the limb in improper alignment and can manifest by shortening of the limb, malalignment of proximal and distal joints relative to each other, rotational abnormalities, and varus or valgus deformities. Further information on orthopedic complications is available in the article, Orthopedic Follow-Up Evaluations: Identifying Complications (September/October 2014), available at tvpjournal.com. Meeson RL, Davidson C, Arthurs GI. Soft-tissue injuries associated with cast application for distal limb orthopaedic conditions. Vet Comp Orthop Traumatol 2011; 24:126-131. Welch JA, Boudrieau RJ, DeJardin LM, Spodnick GJ. The intraosseous blood supply of the canine radius: Implications for healing of distal fractures in small dogs. Vet Surg 1997; 26(1):57-61. Lappin MR, Aron DN, Herron HL, et al. Fractures of the radius and ulna in the dog. JAAHA 1983; 19:643. Waters DJ, Breur GJ, Toombs JP. Treatment of common forelimb fractures in miniature and toy breed dogs. JAAHA 1993; 29:442. Griffon DJ. Fracture healing. In Johnson AL, Houlton JE, Vannini R (eds): AO Principles of Fracture Management in the Dog and Cat. New York: Thieme Medical Publishers, 2005. Budsberg SC. Osteomyelitis. In Tobias KM, Johnston SA (eds): Veterinary Surgery, Small Animal, 1st ed. Philadelphia: Elsevier, 2012. Kraus KH, Bayer BJ. Delayed union, nonunions, and malunions. In Tobias KM, Johnston SA (eds): Veterinary Surgery, Small Animal, 1st ed. Philadelphia: Elsevier, 2012. Meredith Kapler, DVM, is a small animal surgical resident at North Carolina State University. She has presented at the Veterinary Orthopedic Society Conference, instructs veterinary students, and contributed to research articles and a book chapter. She received her DVM from University of Tennessee, completed a small animal internship at Virginia–Maryland Regional College of Veterinary Medicine, and completed an orthopedic research fellowship at University of Tennessee. Upon completing her residency, she will work as a staff surgeon at Veterinary Specialty Hospital of the Carolinas. David Dycus, DVM, MS, Diplomate ACVS (Small Animal), is a staff orthopedic surgeon at the Veterinary Orthopedic & Sports Medicine Group (VOSM) just outside Washington, D.C. He has presented at national meetings and has lectured second- through fourth-year veterinary students. He has published an array of research articles and a book chapter. Dr. Dycus received his DVM from Mississippi State University, completed a rotating internship at Auburn University, and completed an MS and small animal surgical residency at Mississippi State University.